Several years ago I started growing potatoes on the hill above our cabin. There wasn't much soil up there, but over the years thanks to composting and carrying some peat and manure up the hill, I've built up a nice little plot. A big drawback, however, is that it's a long ways above lake level and water in buckets is VERY heavy. Even though we got lots of rain in the spring, summer can get pretty dry. 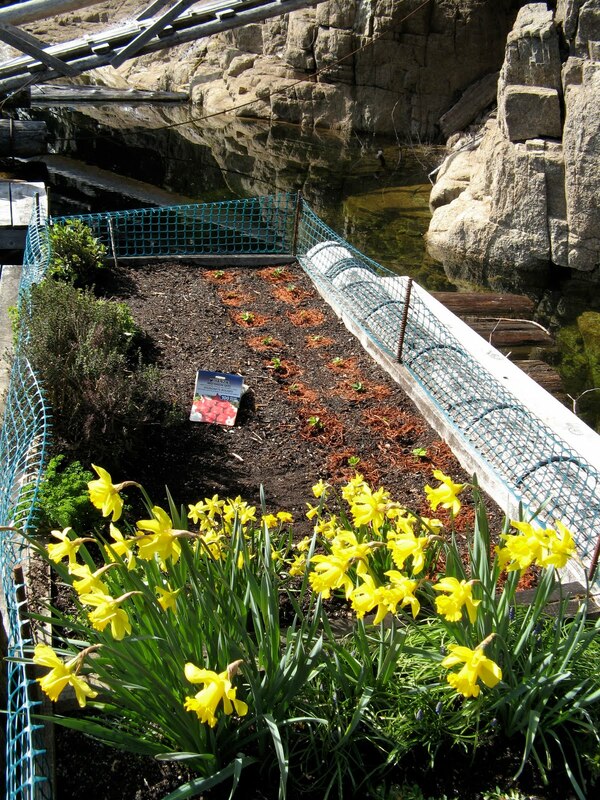 Soon after starting my hillside garden, my good friend John designed a water barrel and rain catchment system. Because of the hilly location, he could install the system higher on the hill and gravity would feed a hose for easy (if a bit low in pressure and slow) watering. A heavy duty plastic tarp is suspended between three trees. 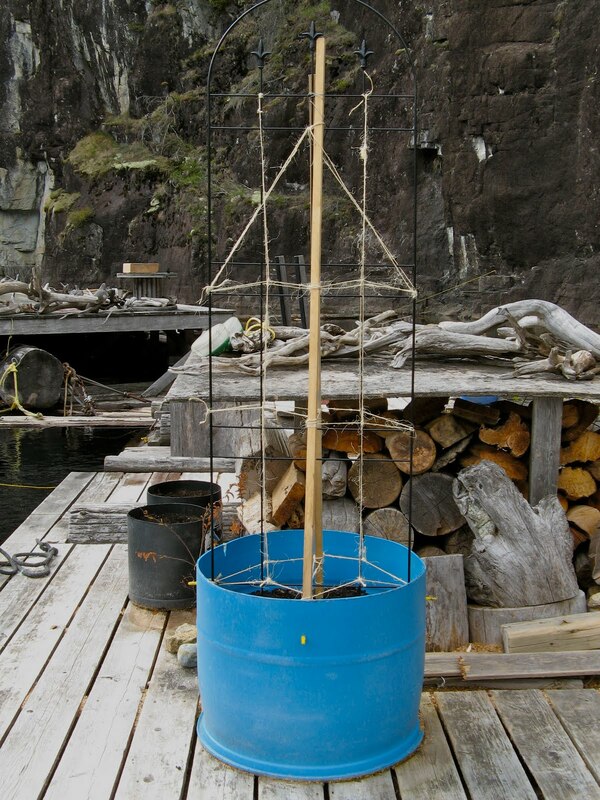 A 2X4 angles the tarp towards a large funnel into the top hole of a 55 gallon plastic barrel. It has remained in place through many wind storms over the last three years. Then this last month, John upgraded my system by adding a second storage barrel. This spring a new visitor came to the cabin. At first I thought it was a robin, but on closer inspection I identified it as a Varied Thrush. It first appeared along the cliff, hopping from one grassy spot to the next, never close enough for a good shot. The ferry between Powell River BC and nearby Texada Island runs day and night, transporting residents and visitors alike. 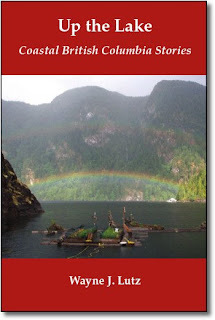 Powell River Books strives to keep up with changes in the publishing industry. 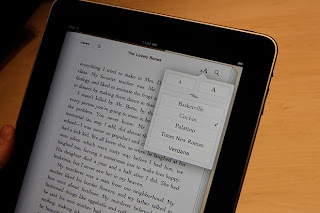 Apple has released their long awaited iPad and among its many uses is as an ebook reader. Wayne's books are already available on Amazon.com for the Kindle. And yes, there is a free Kindle app for the iPad, but many users will want to make their ebook purchases at the iBook store. 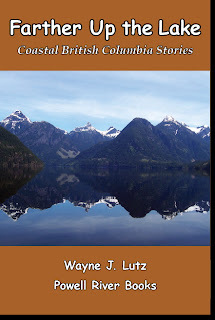 Consequently, all of Wayne's books are now available through Smashwords. 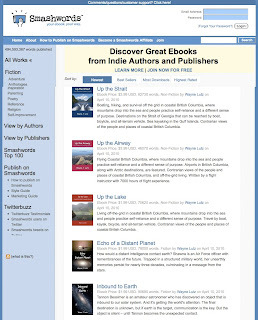 Smashwords is a free ebook publishing and distribution platform. Authors prepare a Microsoft Word .doc file of their book and upload it to the Smashwords website. 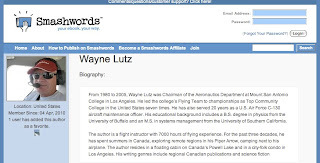 The author maintains all rights to his or her work, but Smashwords helps them distribute their books to online sellers such as Barnes & Noble, Kobo, Sony, Amazon and Apple. 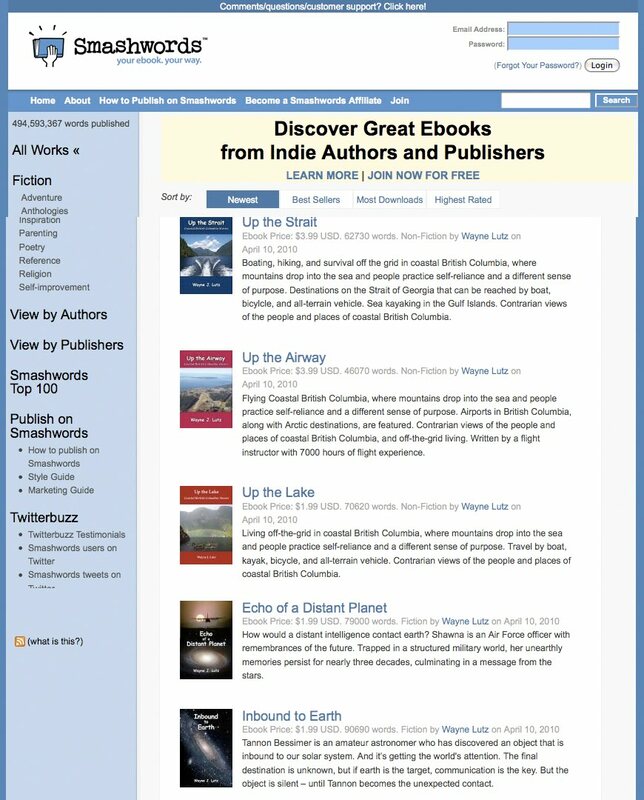 They also sell ebooks in a variety of formats at their own website. Check it out for more information or to browse the many books they have to offer. When we are in Bellingham we often drive to Whidbey Island to visit the Naval Base. And as it happens on most road trips, we get hungry. After conducting our business we head north on State Highway 20. 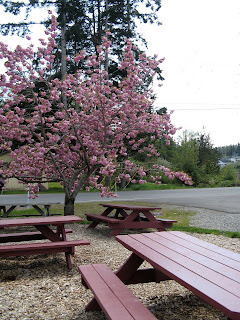 Between the Deception Pass State Park and Campbell Lake on Fidalgo Island there's the small but mighty Shrimp Shack. The full name is Sweet D's Shrimp Shack. It's owned and operated by Dieter and Laurel Drews and has been serving up seafood to hungry locals and visitors since 1973. You can purchase your seafood fresh to take home or have it prepared to order from their takeout window. No longer a seasonal eatery, you can now enjoy their seafood delights all year long. Fresh seafood choices include shrimp, prawns, crab, lobster, oysters, clams and fish. They also have alligator and elk as unique options. Their takeout menu includes burgers, oyster burgers, seafood baskets and ice cream for dessert. Wayne and I picked the oyster dinner basket with four large fried oysters and fries. We shared one order with a pop to hold us over for the rest of the trip home. 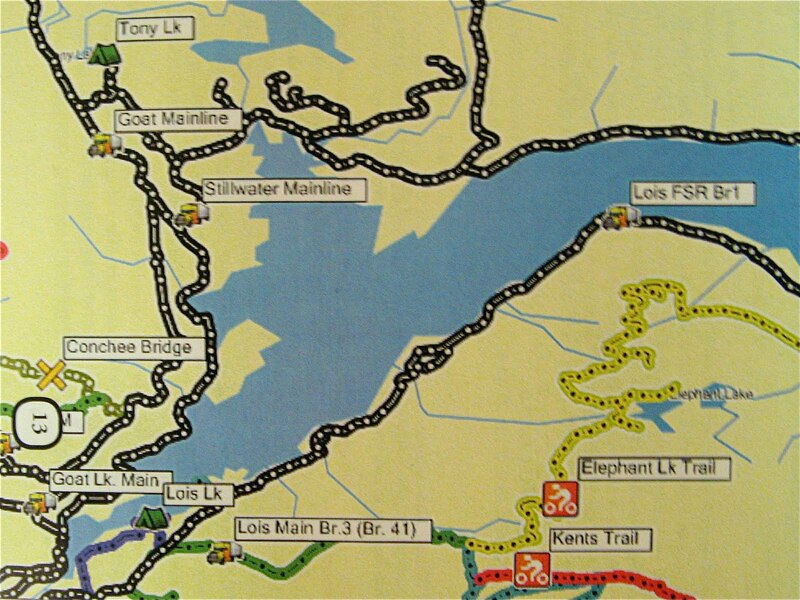 Hike or ride in almost any direction from Powell River and you will be enveloped by the forest. We live in a coastal rainforest environment where trees grow tall and the undergrowth is lush. Large second growth trees cover most of the hills and mountains. You see, we are logging country. They've been reaching for the sky for almost a hundred years now. Down below it stays cool and moist thanks to an almost complete sky covering, with just enough sun peaking through to make everything grow green and lush. Even though it isn't strawberry season up the lake, it is in sunny Southern California. Our market had quarts of ripe berries on sale for $1.98. I picked up two. One we enjoyed fresh, the other I made into strawberry jam. While I prepared the fruit, I brought water in my canning pot to a boil. To sterilize everything, I put clean half-pint (250ml) jars in the boiling water and the screw bands and lids in a separate pan covered with the boiled water. To make it easier to mash the berries, I diced them after washing and hulling. Then I used my wire whisk to lightly crush them to get the juices flowing. The berries went into a large cooking pot along with the sugar. I brought them to a rolling boil, stirring constantly over high heat. Next I added the lemon juice followed by the pectin, still stirring. Once it came back to a rolling boil I cooked it for exactly one minute. At this point, the jam will still be very liquid. I removed it from the heat and let it stand for 5 minutes before skimming the scum that forms on top. It isn't bad for you, it just doesn't look nice. I got my canning jars out of the hot water and let them drain. They need to be hot for the filling process. I filled the jars to 1/8" from the top and wiped the rims and sides clean. I covered them with the self-sealing snap lids. Then the screw bands went on until finger tight. The jam filled four half pint (250 ml) jars with a little bit extra for the fridge. All four sealed jars went into the hot water bath covered by 2" of water. After it got back up to a rolling boil (with the lid on) I timed it for 10 minutes. When done, the jars came out of the water bath to cool. I heard the four distinctive snapping sounds as the seals set. Now we have an alternative to the blackberry jam I made last summer. 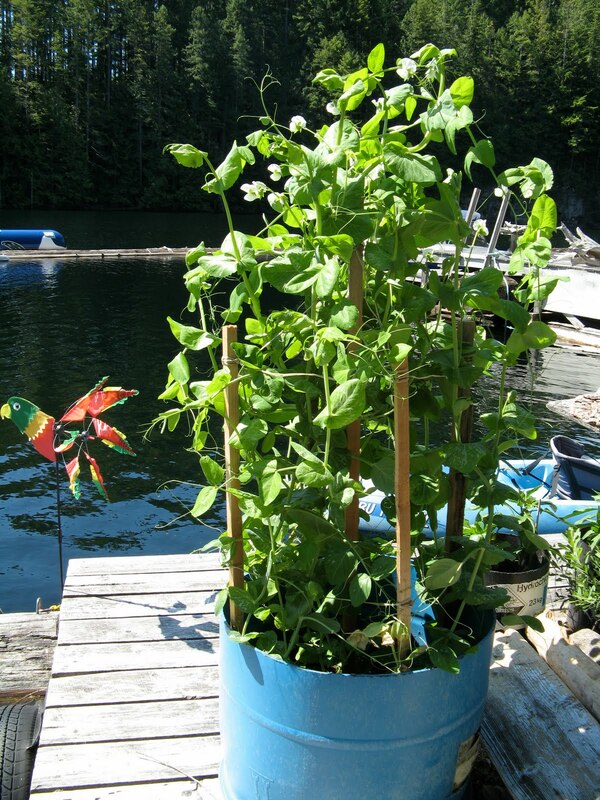 Because of limited space in my floating garden, I grow lots of things in pots on the cabin deck. That's where you'll find my potatoes and tomatoes. Last year I successfully grew Snow Peas in a large pot with a homemade trellis. This year I'm going to move my green beans to a pot as well. That will save garden space for my annual asparagus, strawberries and herbs, and my seasonal carrots, beets, onions, spinach, lettuce, chard and radishes. I've had problems getting beans and peas to sprout directly in the soil. This year I decided to try using potting mix in cardboard egg cartons. To give the seeds a head start, I soaked them in water until they started to swell. I put one seed in each egg cup and covered it with soil. I added enough water to cover each section and a little extra in the bottom to soak up into the cardboard cartons. To give the sprouts a warm moist home, I put the egg carton containers in a plastic tray. The cheapest I found were cat litter pans at about $4 each on sale at Canadian Tire. Four half size egg cartons fit in each tray. Then I cut off the bottoms of gallon milk cartons. Each half egg carton fit snugly under it's own plastic "hothouse." I started twelve Snow Peas and twelve Scarlet Runner Pole Beans with lovely red flowers and tasty pods. That's more than I need for my two 23" diameter pots, but sometimes not all of my seeds sprout. Just a little extra insurance if you know what I mean. I put the plastic tray of mini-hothouses near the sunny window of our condo. They'll stay there unattended for a week until we can return from a trip the States. APRIL 19 UPDATE: My little hothouses were too moist. When I returned, only two of the beans had sprouted. The rest moulded. I think it would have been better to give them a little air each day or maybe less water to start with. Since we use our Kozi woodstove almost 24/7 during the winter, it needs maintenance and cleaning about every two months. We've been good about going on the porch roof and cleaning out the outer section of the pipe, but I'm embarrassed to say that we haven't cleaned the inside section since the beginning of the fire season last fall. The first hint that creosote is building up in the chimney pipe is smoke coming out of the fire box door when it is opened. So when this happened again last week, we picked a fair day to let the fire die out to do the deed. As you can see in the first picture, tapping the pipe dislodged so much creosote that it filled the smoke shelf and pipe connector. First we took down the inside pipe and removed the creosote adhering to the inside walls. A little newspaper on the floor helped keep the mess contained. When everything was done, here is what I saw. It seemed like quite a bit, but I guess I shouldn't have been surprised after so much use over the winter and early spring. Last time we cleaned the pipe we noticed a small amount of smoke coming out through a joint in the pipe near the ceiling. We decided to seal the problematic junction with some Rutland "Seal it Right" to provide a better draft up and out of the chimney. If you would like more information on this subject, I found a good article by The Gas Man at Epinions.com. So far it has remained sealed with no further problems. Chimney cleaning involves some disassembly both indoors and out, but it doesn't take long and the results provide for safer and more enjoyable fires. Play the video clip below to take a look at ours. 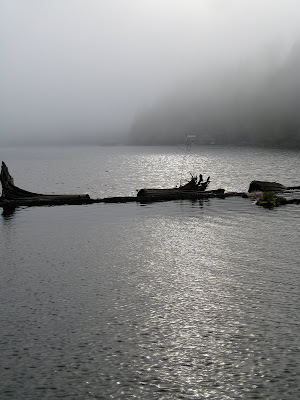 Yesterday was warm and sunny, in the evening it rained and overnight it cooled down - prime conditions for a foggy morning. Sunrise over Goat Island was at about 9:00 a.m. The rays were just visible through the hazy layer. And then about half an hour later it lifted and headed through first narrows. Here's a quick video of the last tendrils moving south. Well, that's what they looked like to me. On our quad ride to Tony Lake last Saturday I found some very interesting snow, ice or frost formations while I was walking in the forest. There were lots of little piles of round, peas-shaped ice. I thought maybe it was snow that melted and refroze, or maybe some type of hoar frost. Yesterday Wayne and I took advantage of a warm sunny day to go quad riding. Our destination was the Knuckleheads Recreation Area so we could play in the snow before it's all gone. We started at our usual offloading spot on Dixon Road south of town. There's a nice wide turnout that holds our long double ATV trailer just right. The first part of the ride was on Goat Lake Main. It's been a while since we've come this way and I was surprised at all of the recent logging. Things must be picking up in the forestry industry. It was interesting to see the different slash areas, some freshly cut, some with very small trees recently planted, and others with growing trees varying in age from 5 to 100 years. Forest management is very important to ensure it is a renewable resource. At Tin Hat Junction we turned right on Stillwater Main and then left to the Knuckleheads. There's pretty good signage so we followed along until we reached A Branch. This is the smaller road leading up to the free public mountain recreation cabin, but well before that destination we found the snow we were looking for. It wasn't deep, but enough to keep us from making any more forward progress. We stopped by a small waterfall to enjoy our lunch. On the way down we decided to take a side road to Tony Lake. I've always wanted to go there and this was a perfect time. Along the way we discovered seven Roosevelt Elk grazing in a recent slash. 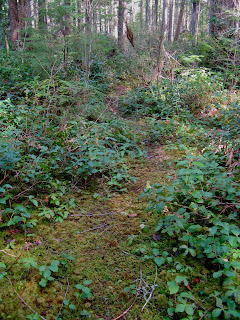 There's lots of open space for grass to grow and fewer trees to hide hunting cougars. They are magnificent animals. So stately and seemingly unafraid. Elk are very social. The group was split when we passed by. The group of four on the hill were waiting for their herd mates to return. Here's a short video. Wayne and I are heading up the lake. The forecast is for partial sun, so I'm going to use the opportunity to work in my floating garden. It's my traditional time to plant seeds in the ground. There is little chance of a frost from here on. If I get things going now I'll be able to start harvesting lettuce and spinach in June. The soil is all ready to go with peat and manure worked in. I have all my seeds, seed potatoes and onion sets. All I need is some quality time with my soil to get it done. p.s. Wednesday Friends Day will resume next week. Be sure to stop by to discover who it will be. There's a famous town in Southern California called San Juan Capistrano. On March 19 (St. Joseph's Day) every year the Swallows return. They flock to the historic Spanish mission founded in 1775. They are Cliff Swallows and build mud nests. Today, Hole in the Wall on Powell Lake started a new tradition. The first Violet-green Swallow returned. According to my bird watching log, last year the arrival date was also April 6. Do you think my cabin might become as famous as San Juan Capistrano? Maybe not, but I thought it was pretty amazing. What internal clocks these birds must have. The poor guy looked a bit bedraggled. Must have been a tough trip from Mexico or Central America. I just finished a book I purchased in the BC Ferries gift shop. They have lots of books of local interest and by Canadian authors. 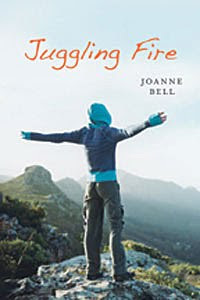 Juggling Fire by Joanne Bell tells the story of sixteen year-old Rachel. She grew up in a remote log cabin with her mother, father and older sister Becky. When she was six they left to move closer to town, but her father's worsening depression sent him back to the Yukon wilderness alone, never to return. Rachel has clung to hope that he's still out there, and undertakes a quest to discover the truth. Brooks, her half hound and half malamute/Newfoundland cross pup reluctantly joins the journey. 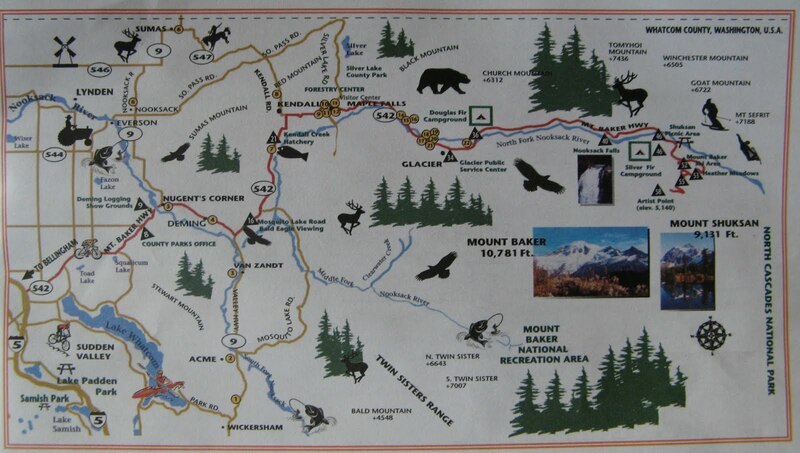 Rachel navigates her way back to the family cabin with relative ease, but an encounter with a grizzly along the way leaves Brooks severely wounded. Fairy tales and juggling keep Rachel focused and in control of her emotions during difficult times. This journey into the past is no different. Can they sustain her for what she'll find at the end of her odyssey? Juggling Fire was published by Orca Book Publishers in 2009. The author, Joanne Bell knows the wilderness well having lived in New Brunswick, Alberta and British Columbia. She lives in a log cabin near Dawson City in Yukon where she runs dogs, hikes, canoes and enjoys nature. She also serves as a naturalist and substitute teacher, passing along her love of the outdoors to future generations. Friday was a very windy day here in Powell River BC. This lone barge was stuck in the waves riding out the storm. The city of Powell River BC looks across the waters of the Strait of Georgia towards Vancouver Island. That makes for some really spectacular sunsets. 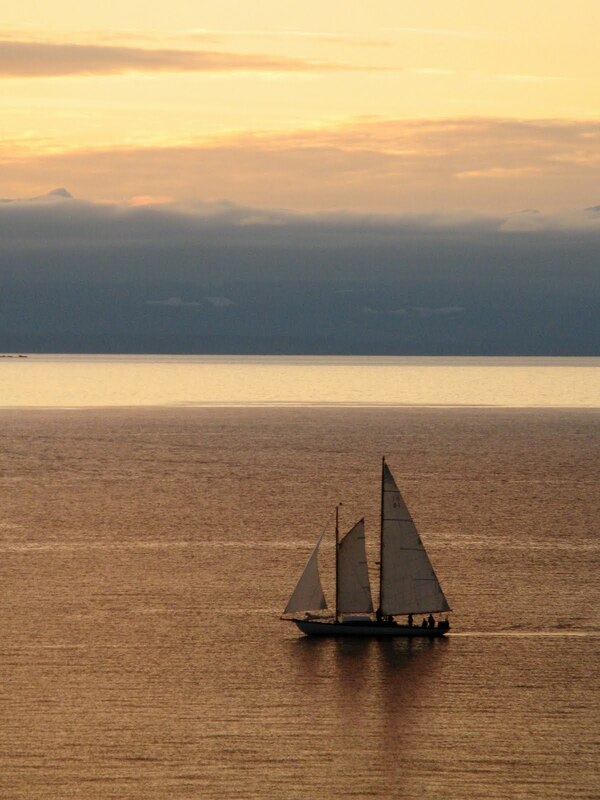 Not long ago I looked out my front room window and saw this lovely sailing ship passing by. Yesterday was my mom's 94th birthday, so we all bundled up and went on a road trip up the Mount Baker Highway. Mom rode shotgun and our good friend Jeanne drove. We started at the junction of I-5 and Sunset Drive then headed east. In a few miles we left busy Bellingham behind and entered lush green fields dotted with farmhouses. Along the way there were lots of Christmas tree farms and u-pick berry fields. We'll have to come back this summer for sure. At about the 25 mile mark we entered the small village of Maple Falls. We pulled into the Frosty Inn. It was just what we were looking for. Inside were two locals drinking coffee and talking about "the old days" and a cheery fire was burning in the dining room. Just the place to get a leisurely late breakfast fit for hungry travelers. The friendly waitress took our order and made us feel right at home. If you are headed up to Mt. 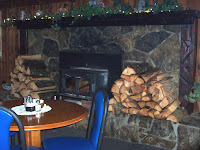 Baker for skiing or sightseeing, I highly recommend stopping at the Frosty Inn for breakfast, lunch or dinner. It also appears to be a night spot, too. After a hearty breakfast we continued up the road towards the ski area. In Glacier, there were several ski and snowboard rental shops, more restaurants and a few places for lodging. Just before the road started the final climb to the Mount Baker Ski Area we decided to turn around. The snow along the side of the road was building up and we didn't have chains with us today. We reversed course and followed the Nooksack River back down to the coastal plain. It was a gorgeous day for a drive in the mountains. Puffy white clouds stood out against the clear blue sky. Before we returned to town we stopped briefly at the Deming Homestead Eagle Park. It's a great place to view Bald Eagles in winter months, but today the robins were heralding spring instead. 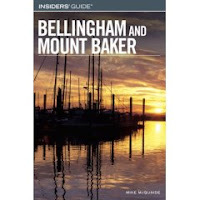 To plan our trip, we used an excellent guidebook, the Insiders' Guide to Bellingham and Mount Baker by Mike McQuaid. He is a Bellingham local that really knows the area. It is available at Amazon.com by clicking here. If you are coming to Bellingham it's a must.